WASHINGTON — Space Exploration Technologies Corp. moved a step closer to being allowed to bid for U.S. national security launch contracts with the Air Force announcing that the Sept. 29 debut of the company’s Falcon 9 v1.1 rocket will count as the first of three required successes despite SpaceX’s failure to reignite the rocket’s upper-stage engine following deployment of its satellite payload. The Air Force’s formal certification of Falcon 9 v1.1’s maiden launch was announced Feb. 25. The upgraded rocket has launched twice since it debuted last September carrying Canada’s Cassiope space weather satellite and three secondary payloads to low Earth orbit. 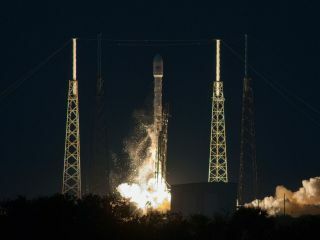 SpaceX successfully delivered the SES-8 telecommunications satellite to geostationary transfer orbit Dec. 3 and followed with a successful Jan. 6 launch of the Thaicom-6 satellite. The Air Force is still evaluating those flights, although Air Force leaders have said they do not expect problems. “[The Sept. 29] flight represents one of many certification requirements jointly agreed to between the Air Force and SpaceX,” Lt. Gen. Ellen Pawlikowski, commander of the Space and Missile Systems Center at Los Angeles Air Force Base, said in a Feb. 25 press release. Meanwhile, SpaceX Chief Executive Elon Musk and United Launch Alliance Chief Executive Michael Gass are slated to testify side by side March 5 at a Senate Appropriations defense subcommittee hearing on national security space launch programs. Senators are expected to ask about the structure of the competition, savings on a recent deal between the Air Force and ULA on the first batch of rockets in the block buy, and the EELV contract structure under which ULA receives two separate lines of funding: one for launch vehicles and related services and one for launch capability funding.